Buy 2 for $50 each, SAVE $19.95! Herbs of Gold Bio Curcumin 5400+ contains Meriva® curcumin, a patented form of curcumin, specifically designed for effective natural relief of pain and inflammation. Curcumin is the active component of Turmeric. Turmeric has a long history of use in Ayurvedic medicine as an anti-inflammatory and anti-arthritic. These actions have been supported by studies that show anti-inflammatory and anti-arthritic activity of curcumin. Curcumin is known to be very poorly absorbed. Bio Curcumin 5400+ has undergone a patented process to improve absorption and bioavailability. 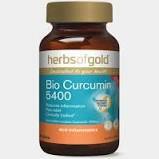 Bio Curcumin 5400+ has been shown to be 27 times more absorbable and bioavailable than regular curcumin. The daily dose of Bio Curcumin 5400+ provides 200mg of Meriva® curcumin, with absorption equal to 5400mg of regular curcumin, and is beneficial for the relief of symptoms of mild arthritis at much lower doses than regular curcumin. Bio Curcumin 5400+ has been clinically trialled* for the relief of pain, joint swelling and inflammation associated with mild osteoarthritis arthritis, and for increasing joint mobility in mild osteoarthritis. Bio Curcumin 5400+ assists healthy joint function by helping to relieve joint stiffness, inflexibility and immobility associated with mild arthritis and mild osteoarthritis. Bio Curcumin 5400+ helps reduce inflammation, joint discomfort, aches and pain associated with mild arthritis and mild osteoarthritis.